Political rhetoric blaming government regulations for stifled small business growth is at an all-time high, and it’s no surprise that the U.S. Chamber of Commerce is behind most of it. The Chamber has a long history of opposing regulations under the guise of being a voice for small business. Whether it’s the overtime rule that would provide overtime pay to millions of middle income Americans, the Clean Water Rule to protect our streams and rivers, the Clean Power Plan to limit power plant emissions of greenhouse gases, and the open internet rules to preserve net neutrality, the Chamber has yet to meet a regulation it didn’t want rolled back. The Chamber also called for the repeal of the Affordable Care Act (ACA), supporting the American Health Care Act, despite the 24 million who would lose health care. But it doesn’t stop there. Tom Donohue and his big business allies would also like to see a repeal of Dodd-Frank Act, and specifically condemned the Volcker Rule to limit speculative trades by banks of the kind that led to the 2008 Financial Crisis and has vowed to fight against the fiduciary rule, which protects retirement savers from dishonest investment advisors. 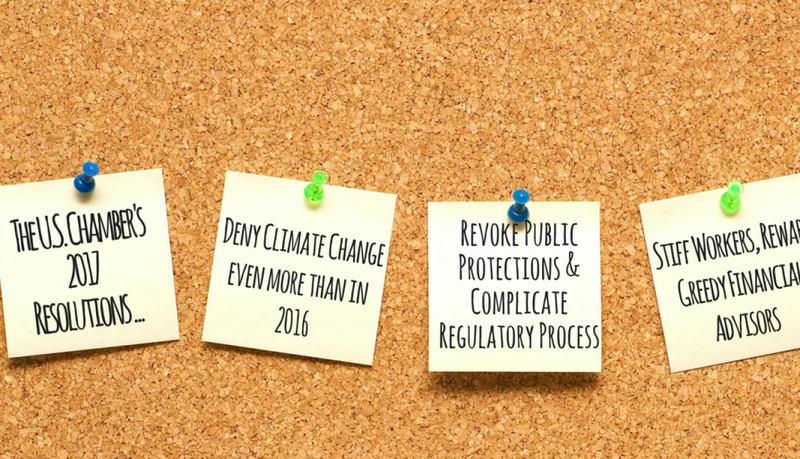 Not only has the Chamber come out in favor or nearly every CRA challenge we’ve seen since Trump took office, it is also a strong supporter of the Regulatory Accountability Act, which would hamstring future efforts to protect consumers, workers, and the environment by layering on so many additional process requirements that rulemaking to protect the public would essentially come to a halt. Just last week, the Chamber released two video ads, targeting Senators Heitkamp and McCaskill, urging them to support the RAA. All of this, under the clever, yet dishonest PR scheme that regulations hurt, and never help, small businesses. It makes perfect sense- if the Chamber and big business want to accomplish the corporate windfall that would result from a deregulatory agenda, the best way to do so is to tout themselves as the advocate of Main Street. However, many of the regulations that Donohue mentions don’t even apply to small businesses, and others, like the Clean Water Rule and the CFPB actually help small businesses. While these conservative talking points often misleadingly focus on the burdens that regulations place on small business, surveys and poll data show that the very owners of these small businesses generally do not agree with their alleged advocates. According to a poll by Small Business Majority, 86% of small business owners agree some regulation of business is necessary for a modern economy, and 93% of them agree their business can live with some regulation if it is fair, manageable and reasonable. What’s more, 78% of small employers agree regulations are important in protecting small businesses from unfair competition and to level the playing field with big business. Another 79% of small business owners support having clean air and water in their community in order to keep their family, employees and customers healthy, and 61% support standards that move the country towards energy efficiency and clean energy. This runs directly contradictory to the Chamber’s lobbying for the repeal of Stream Protection rule, and the Oil Anti-corruption rule, which would leaving communities susceptible to water pollution by coal miners, and enable oil tycoons to avoid transparency. Regulations do help small businesses and a lack of regulation can have detrimental effects. Just yesterday, a small business owner testified before the House Small Business Committee and urged lawmakers to ensure that public protections are in place to give his catering business fundamental confidence that the food and water they serve and consume is safe. Regulations provide the market with a basic level of certainty to ensure we are protected from tainted food, unsafe drugs, poisoned water, and polluted air. There are other regulations, such as anti-trust laws that address price discrimination and price fixing, that help small business owners by leveling the playing field against larger businesses. The Chamber also fails to mention the many regulations enforced under the Small Business Administration that small businesses are prioritized for a certain set of government contracts. When regulations don’t exist, it is typically small businesses who suffer most. The Deepwater Horizon explosion in the Gulf of Mexico devastated small businesses in the tourism and fishing industry, and not surprisingly it was the U.S. Chamber of Commerce who went to court on behalf of British Petroleum and sought to keep the local small businesses out of court, all the while claiming to be the voice of Main Street. While the Chamber is spending big bucks to lobby against commonsense protections, it is crucial to remember that clean air, clean water, and regulation of Wall Street protect the public. Clear rules protect small businesses and manufacturers from powerful interests who use their financial advantage to try to rig the system in their favor.